At 2 years old, Kori’s leg was amputated below the knee due to injuries sustained in a lawn mower accident. Ever the “tom boy”, Kori loves to play sports. Everything from soccer to football to basketball – you name it, she’ll try it! However, Kori’s athletic potential was stifled due to the fact that she didn’t have a foot specifically designed for running. 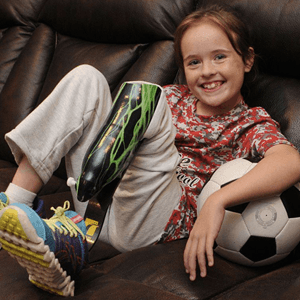 Kori’s running leg allows her to keep up with the other kids and play all of the sports she loves. Running legs are typically deemed as “not medically necessary” by most insurance companies and therefore not covered.